The Reader is going to this year’s Cheltenham Literature Festival to bring you news from the festival direct to this blog. The focus of this year’s festival is ‘What does change mean to us?’ and there will be reports on the dynamic debates, critical conversations and inspiring ideas that the festival guests have to offer. The festival is up on our calendar and I’ll add specific events as tickets are confirmed. Hopefully I’ll be able to interview some of the speakers formally (although I look forward with great anticipation to ‘bumping’ into them more informally), to get a unique insight into their experiences of the festival and ask how important books and reading are to their lives. I’ll be jumping at every opportunity to ask the literary folk in Cheltenham for their book recommendations, top tips on who to keep an eye on and will report it all back via The Reader Online. The best way to get updates is to subscribe our RSS feed. 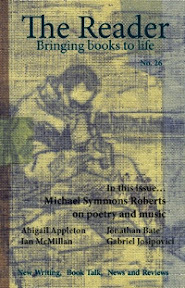 Philip Davis, editor of The Reader writes to say that Ian MacMillan, poet, performer and broadcaster is to become a regular contributor to the magazine, starting with the Christmas 2007 edition. Ian MacMillan, who has been described by the TES as “the Shirley Bassey of performance poetry”, presents The Verb on BBC Radio 3 and has recently been appointed Poet in Space by the Yorkshire Planetarium. We’re pleased to be on his trajectory.